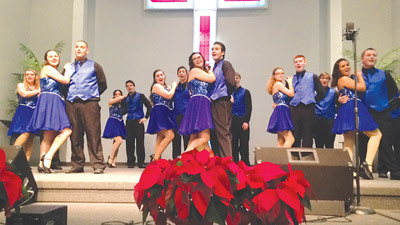 Acadia Bravo, center, performs at the Walk through Bethlehem, Dec. 13, at Kings Point Baptist Church. Acadia will perform as part of the All-County Chorus at 6:30 p.m., Jan. 23, at East Bay High School, where she will also receive the Master Musicianship Medal from her teacher, Liz Stewart. Heather Bravo photo. Imagine a starter on a high-school football team named not only to the All-County squad but also to the State All-Stars and along the way collecting one of the highest honors to which a high school student can aspire — and doing it all in his freshman year. Riverview High’s Acadia Bravo has done just that in music, achieving an unheard-of triple crown her music teacher has never seen another student accomplish — let alone a student in her first year of high school. Acadia not only made the All-County and All-State Chorus, the Riverview teen was recently named a Master Musician. She will receive her medal Jan. 23 at the All-County Chorus Concert at East Bay High School. “I held a musicianship class last summer, and she was the student that consistently came every week,” said Liz Stewart, Acadia’s music teacher and Riverview’s choral director. Acadia used the class to prepare for the All-State Chorus test, a daunting three-step process. A student must first pass a music theory exam. Pass that, and it’s on to a sight-reading exam where an applicant is handed music she has never seen before and given 10 seconds to study it. She then must sing the piece with rhythmic and tonal perfection. Clear that hurdle and the student must next learn eight or nine various pieces in three or four different languages and then perform at an audition. Rank high enough after all three tests and an applicant makes the All-State Chorus. “The process determines not only their ability as singers but also as musicians. It’s about a whole lot more than just singing,” said Stewart, who had an 18-year career as a private voice teacher before moving to the classroom in 2004. “This young lady was determined as a freshman to make All-State Chorus and the All-County Chorus.” Most students don’t make All-State until 11th or 12th grade. The Master Musicianship Medal, a scholarship given by the Hillsborough County Secondary Music Teachers Council toward music classes, is also the purview of mostly older students. “This young lady, in the first half of her freshman year, made All-County, All-State and Master Musician,” Stewart said. “It’s a huge achievement.” No one in Stewart’s experience has ever attained the trifecta of honors. “I’ve had students make All-State and All-County and students make Master Musician, but never all three,” she said. Acadia was “ecstatic” when she snared the honors. “I put blood, sweat and tears into it,” she said. Acadia started singing in third grade at Brandon Academy, encouraged by her teacher, Becky Lawrence. Enthusiastically backed by teacher Gilbert Lopez at Rogers Middle School, Acadia made it to the All-County Hillsborough County Middle School Chorus as a ninth grader. Not from a particularly musical family, Acadia has always been encouraged by her mom, Heather, to pursue her interests wherever it leads. At a time when most of her fellow freshmen are dreaming of becoming the next Lady Gaga or LeBron James, Acadia has a singular vision for her future.